In the tradition of Michael Lewis’s Moneyball, award-winning historian S.C. Gwynne tells the incredible story of how two unknown coaches revolutionized American football at every level, from high school to the NFL. Hal Mumme is one of a handful of authentic offensive geniuses in the history of American football. The Perfect Pass is the story of how he irreverently destroyed and re-created the game. Mumme spent fourteen mostly losing seasons coaching football before inventing a potent passing offense that would soon shock players, delight fans, and terrify opposing coaches. The revolution he fomented began at a tiny, overlooked college called Iowa Wesleyan, where Mumme was head coach and Mike Leach, a lawyer who had never played college football, was hired as his offensive line coach. In the cornfields of Iowa, while scribbling plays on paper napkins, these two mad inventors, drawn together by a shared disregard for conventionalism and a love for Jimmy Buffett, began to engineer the purest, most extreme passing game in the 145-year history of football. Implementing their “Air Raid” offense, their teams—at Iowa Wesleyan and later at Valdosta State and the University of Kentucky—played blazingly fast—faster than any team ever had before, and they routinely beat teams with far more talented athletes. And Mumme and Leach did it all without even a playbook. Their quarterback once completed sixty-one of eighty-six passes, both collegiate records. In The Perfect Pass, S.C. Gwynne explores Mumme’s leading role in changing football from a run-dominated sport to a pass-dominated one, the game that tens of millions of Americans now watch every fall weekend. Whether you’re a casual or ravenous football fan, this is a truly compelling story of American ingenuity and how a set of revolutionary ideas made their way from the margins into the hot center of the game we celebrate today. "The most entertaining book on football this decade." "A rousing tale of innovation finding success in the face of the gale-force winds of convention." 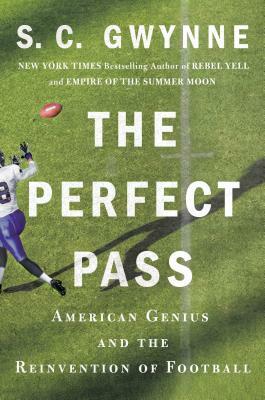 "The Perfect Pass is a perfect book about football—and the transformative power of innovation. S.C. Gwynne brings the same remarkable reporting and storytelling skills he used in Empire of the Summer Moon and Rebel Yell to reveal the dramatic history behind the passing revolution that disrupted and forever changed America’s favorite sport. His portrait of Hal Mumme, the unknown underdog coach who unleashed the Air Raid offense on the modern game, is superb, at once capturing the passion and genius that made him an unsung hero of his generation." "When we played against a Hal Mumme offense, our defense had to be changed dramatically. You had to throw away everything you knew or you were going to get beat. Every offensive coordinator and defensive coordinator in football better study this book to find out why." "Hal Mumme has always been a true American genius, and every year teams running his offense are among the tops in yards and points. I know, because I would've liked to have hired him. He has a brilliant football mind, and here at last is his amazing story, told in full." "If you are a coach, a manager, an entrepreneur, an executive, an MBA student, etc. looking for a real life example of thinking way outside the box and changing your industry or field completely, then The Perfect Pass is the book for you. Read it, digest it, and then apply it to your life’s work." "The tale of Hal Mumme and how he changed American football is a David and Goliath story with similarities to Michael Lewis's Moneyball: The Art of Winning an Unfair Game, about the Oakland Athletics baseball team and its number-crunching general manager, Billy Beane. That was a different sport and era, but both Beane and Mumme found themselves in underdog positions and used creative, out-of-the-box thinking to level the playing field." "Along with his protégé Mike Leach, now the head coach at Washington State University, Mr. Mumme revolutionized their sport in ways that, frankly, dwarf the legacy of Billy Beane and his gang from 'Moneyball.'" "Informative and entertaining and a must read for anyone interested in the inner game of football strategy....If you are a football coach, football fan or simply a guy who likes a good story, S.C. Gwynne scored a touchdown."